…to the better of Electric Cars so far…! 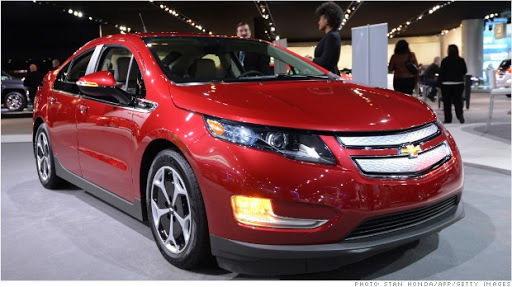 28,000$ GM Volt with a gas/gasoline generator…! General Motors announced Tuesday that it will knock $5,000 off the sticker price of a new Chevy Volt, making it the latest electric car to be steeply discounted as automakers battle for buyers. Customers will be able to get the discount on 2014 Volts, reducing the car’s starting price from $40,000 to $35,000. Government tax rebates can bring the price down as low as $27,495, GM says. Simply put, the Volt is a quantum leap forward in automotive innovation. An electric car that delivers up to 60 km1 of pure electric, responsive driving on just one charge from any standard electrical outlet. Need to keep going but can’t stop to plug in? Its range-extending gas generator seamlessly kicks in to help get you there. It’s a moon-shot. It’s a game-changer. It’s the Chevrolet Volt. …though I had criticized GM VOLT, it was a logic conception CRITIQUE, and not a comparative CRITIQUE with other electric VEHICLES…! …to be fully electric and plug in, and not hybrid, AND HAVE A GASOLINE GENERATOR on board to charge and/or SIMPLY PROPEL YOUR electric motor, IS THE BEST THING YOU CAN FIND…! …MIND YOU THAT, though nobody has said it or IT IS A WELL KEPT SECRET…! YOU CAN, WITH THE RIGHT GEARING, make a nearly permanent motion ELECTRIC CAR, WITH A FEW NORMAL BATTERIES OR OF LITHIUM-ION, directly generating current, above the required to reach even good top speeds of most driving…! BUT THE SECRET OF THE WORLD IS, that they want to USE UP all CRUDE OIL, to self destroy the World, to Hunger, Global Warming, Global rising of Sea Levels, and who knows what other CONSEQUENCES…!!! NO FEAR, proper good technology, compared to what most Vehicles are, is only for the savvy and the Courts to determine, that they are really rubbish for the IGNORANT…! ← …let your yea be yea, and your nay nay…! DO YOU READ YOUR BIBLE [ that is some general knowledge, but mostly non-sensical verbose prose of a mix up of things…! ] ?? ?